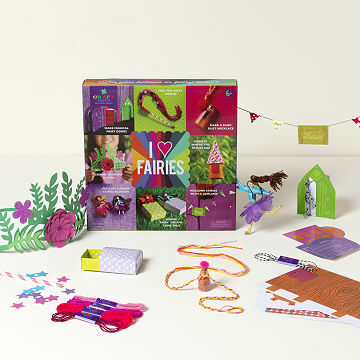 Kids will love making everything from fairy beds to a "fairy dust" necklace with this colorful kit. Bring a DIY dimension to a miniature universe of magical beings. Kids will love making everything from tiny fairy doors, to fairy beds, to a welcoming garland, a "fairy dust" necklace and of course, the pretty fairies themselves. Girls and boys with their own fairy gardens will happily spend a rainy day or two indoors with this kit, which contains all the materials for eight cute projects. This is an adorable fairy kit, my daughter loves it! My niece is going to LOVE this for her Christmas present! My great niece loved it!